Quick Answer: One-point perspective is a way of crafting cinematic shots with near-perfect symmetry. The composition of these shots draws the viewer's eye to a specific focal point within the frame, absorbing them into the dimension of the shot and manipulating the experience by telling them exactly where to look. It also elicits an emotional response, typically of uneasiness or dread. Stanley Kubrick is remembered for many reasons -- for making some of the most beloved films in cinema with unrivaled precision, being a relentless director that regularly demanded dozens of takes in the name of perfection, and for his frequent use of a compositional technique known as the “one-point perspective.” That last quality might not be the most definitive criteria upon which the typical moviegoer remembers Kubrick’s legacy, but it is one of the reasons that Kubrick's name has become synonymous with obsessive composition among filmmakers and cinematographers. It is what people are actually talking about when they describe something as “Kubrickian.” One-point perspective refers to the symmetry of Kubrick’s shots. Kubrick's films often deal with violence or, at least, subjects demanding a dramatic sincerity. By using symmetry in so many shots, Kubrick is able to amplify the seriousness of the material. Even when nothing is happening, putting our focus on a particular point makes us wonder when something will, creating an environment of tension and anticipation. Of course, Kubrick didn't invent one-point perspective. It is a technique that has been employed in photography and the fine arts for centuries. 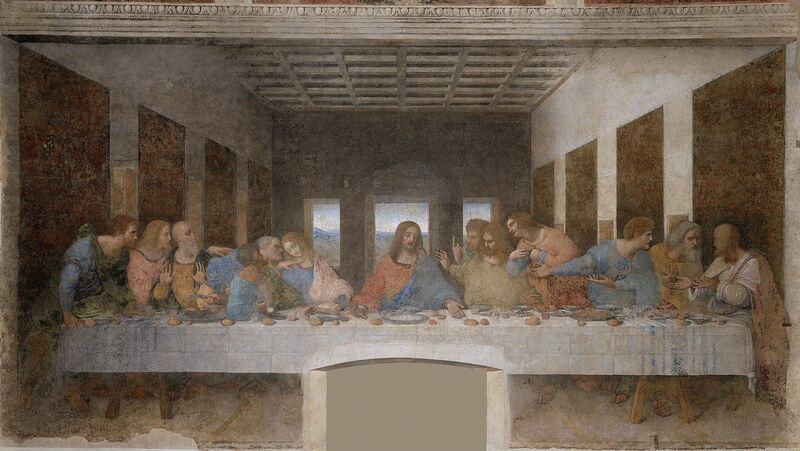 Even Leonardo da Vinci's famous "Last Supper" painting is an example of one-point perspective, as the horizon line runs along the heads of the characters in the piece, leading to and vanishing at the figure of Christ. This structure demands the viewer's immediate focus on Christ as the central subject. But Kubrick is the one given credit for truly perfecting the art of one-point perspective in a cinematic context for psychological reaction. Kubrick started showing an obsession with one-point perspective and symmetry before his film days, when he was employed as a photographer for Look Magazine. 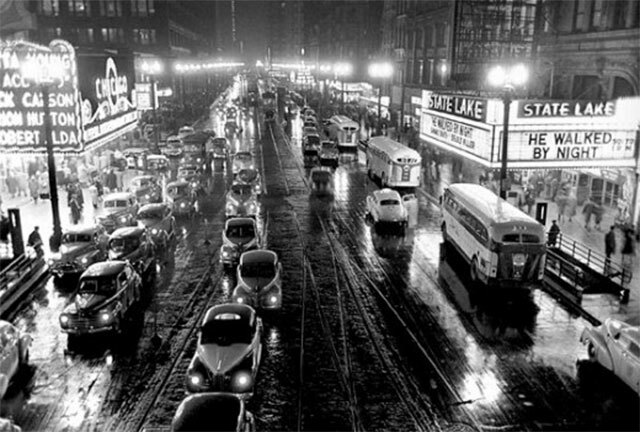 A photo essay titled “Chicago - City of Extremes” shows the type of images that would become his cinematic trademark. Most of Kubrick's films would go on to use one-point perspective as a means of directing the viewer as they watch, controlling their avenue into the scene's on-screen action and enveloping them in the three-dimensional nature of the work. OpenCulture describes one-point perspective as when "the painting plate (also known as the picture plane) is parallel to two axes of a rectilinear (or Cartesian) scene – a scene which is composed entirely of linear elements that intersect only at right angles. In other words, all the visual lines in these shots appear to converge on a single point, usually dead ahead." Wes Anderson is the director typically regarded for utilizing one-point perspective in modern films. Unlike Kubrick, he often employs the tactic for comedic effect. It often still builds tension, but Anderson has translated the technique for an entirely different purpose that has helped him establish his own identifiable brand of filmmaking the way Kubrick did. In the old days of cinema, one-point perspective was common because of budgets and the practices of filmmaking. If you looked too far left, right, or up, you'd see the edge of sets or the rafters holding lights. It became a traditional form of cinematography simply out of necessity. Later, one-point was cleverly used by directors like Kubrick and Anderson in order to forge a trademarked personal style that reversed the basics of filmmaking. These directors are famous for holding true to their personal visions and not catering to the typical genre styles of their respective eras. Of course, one-point perspective remains a cinematic trick and is not the totality of how any director or cinematographer should be defined. It is a deliberate means of focusing the viewer's attention to a particular area of a frame, absorbing him or her in the scene and encouraging an emotional response. Countless films use it at one point or another, but the two directors above provide the most regular examples through which the term can be understood.